This is Gunther Hermann, one of your cuddly little cyborg partners at UNATCO. Although released a few years ago, Deus Ex can still easily be recommended as a good game. Actually, gamers get the best of both worlds; a compelling and still visually appealing game combined with a bargain price and the fact you dont need the latest computer to run it. While the Game of the Year addition, which included multiplayer capabilities, still suffers from some minor flaws, Deus Ex remains one of my favorite first person shooters. In a novel approach from the Quake and Doom splatterfests, Deus Ex delivers up a heaping helping of plot and atmosphere. The world of Deus Ex is dark and grimy, which adds a level of fear and uncertainty that many games lack. Control is easy, and the game almost bends over backwards to make sure you know what youre supposed to do at all times. In addition to listing you mission objectives, the game also automatically lists every important code and piece of information you receive, AND records every conversation you have with every person. Although at first this may seem like overkill, this feature becomes infinitely useful the minute you have to remember a six digit code or password given to you ten minutes ago. In fact, even with the message logs I would recommend writing down anything important. The skills section allows you to upgrade your weapon, hacking, and other abilities. 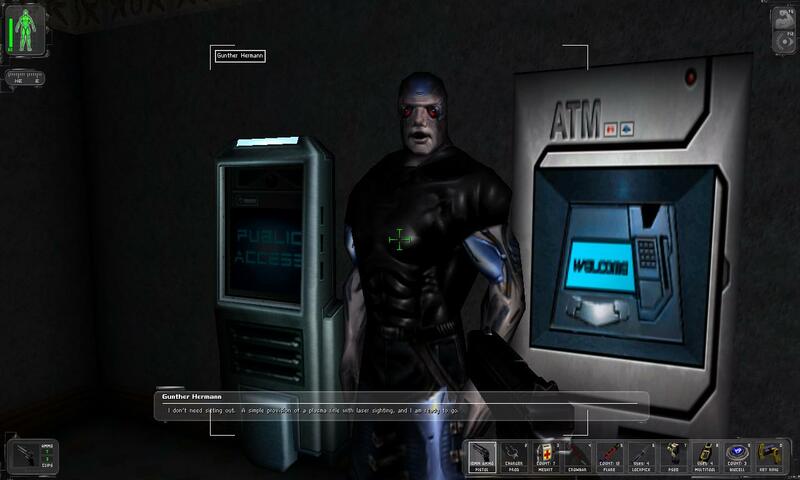 Since you get the points for the upgrades through exploration and completing missions, this gives Deus Ex RPG elements that allow you to customize your character to suit your tastes. The skills come in handy when it comes to the inventory screen, since Deus Ex only allows you a limited space to store all your weapons and items. This adds a strategic element to the game, since you dont want to pick up everything you see. Careful skill selection and managing your inventory are critical to beating the game. Set in the future, Deus Ex plunges you into a conspiracy that would make Fox and Scully blush. The newest member of the newly formed UN counter-terrorism agency UNATCO, you are first charged with recapturing the Statue of Liberty from a nationalist militia. From the moment you step off the dock, you are faced with a variety of choices on how to proceed. Do you burst into the scene with guns blazing, or lurk in the shadows to avoid the patrols? Do you hack the security computer, try to find the password, or bypass security completely? Unlike most other games, Deus Ex provides a surprising level of open-endedness in how you go about accomplishing your objectives. This not only gives you a greater feeling of control over your actions, but it also adds replay value. In the course of the game you brush up with almost every well known conspiracy theory, from secret societies to who really killed Kennedy. Much of this back story is optional, and gives you another reason to fully explore the game world. Deus Ex is a great bargain for anyone wanting a game that will slowly consume several hours of their lives. Because its been a while since it was released, prices are in the $19.99 and below range. Its few flaws are hardly noticeable and easily overcome. In short, there is no reason why you should not own or buy this game. Gaming Hyena gives Deus Ex 9/10.